Order your Levy's 2 1/2" Wide MSS17-BLK Classic Platinum Collection Strap Black from AMS and enjoy 0% Interest Payment Plans, Free Shipping, Free Extended Warranty & 45 Day Money Back Guarantee. 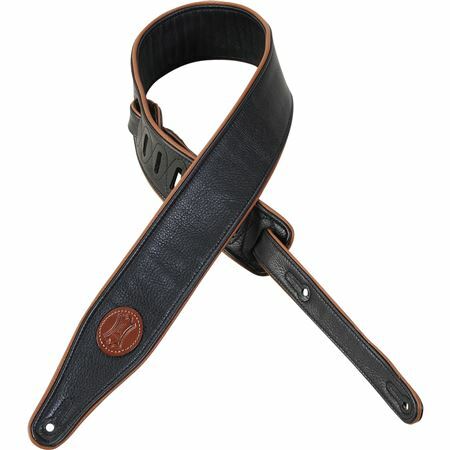 Featuring comfortable foam padding, the MSS17 is a 2 1/2" garment leather guitar strap offering caramel colored leather piping and garment leather backing. Adjustable from 41" to 56". Every Levy's strap is designed to be comfortable, durable, and fashionable, because it's not just something to hold up your guitar; it's something you wear. By continually developing new designs and improving existing ones, Levy's offers the highest quality and broadest variety of guitar straps on the market. From simple to elaborate, from classy to crazy, from lightweight to heavy-duty, there's a Levy's strap for every player.